When you visit Wyoming, whether on a business trip or for a vacation, you will find yourself with a long list of hotels to choose from. These vary from resorts with all the amenities you could possibly want to cozy inns that will make you feel at home. 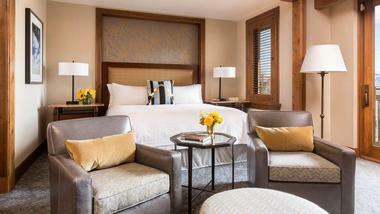 The Four Seasons Resort Jackson Hole is a Five-Star Alpine Resort with views of rugged peaks and easy access to ski runs and other outdoor activities. Guest rooms have twice-daily housekeeping, global news and local newspapers via Press Reader, safes, irons, multi-line phones featuring voicemail, tea/coffee makers, mini-fridges, personal bar menus, standard Wi-Fi, Bluetooth iHome/clock radios, Smart TVs featuring Guestek for streaming, down pillows and duvets, available hypoallergenic duvet and pillows, lighted makeup mirrors, hair dryers, and thick terry-cloth bathrobes. Or upgrade to a suite with sofa beds and separate bedrooms, or private residences for additional privacy and the feeling of home. Guests at the resort can easily go outside to raft, bike, hike, ski, or simply enjoy the outdoors in another way. Get a massage at the Spa or unwind with a dip in the heated year-round pool. There are three hot-spring-style whirlpools, an open-air fireplace, a business center, two on-site boutiques, a complimentary house car, a ropes course plus via ferrata, paddleboard and bike rentals, a ski concierge, and hiking trails. Dine at The Handle Bar for pub fare, the Westbank Grill with its stone fireplace, or the Pool Café before getting a drink in the Ascent Lounge. Amangani is surrounded by natural beauty with its location at the Teton Mountain’s foothills, delivering year-round adventures with fresh mountain air. All suites have their own patios or balconies with expansive views or get extra privacy and space in a home. Expect features such as prominent use of stone and wood, spacious bathrooms, bathtubs, dressing rooms, twin vanities, showers, Wi-Fi, safes, TVs with DVD players, A/C and heating, a personal bar, woven cowhide chairs with faux wolf fabric, window-side daybeds, and/or fireplaces from the suites. Homes have between four and six bedrooms, spacious living areas, and floor-to-ceiling windows, some with workout studios, hot tubs, libraries, and/or media rooms. Guests can go for horseback rides, hikes, hot-air balloon rides, and more. Relax as you explore the paths left by elk and moose. In the winter, enjoy snowmobiling, skiing, or snowboarding. Enjoy the property’s heated 377-square-foot outdoor infinity pool. Choose a treatment at the Spa or get in your workout at the Fitness Center or training studio. Choose from one of the three venues on property, including The Grill where you will find locally-sourced and sustainable ranch meats along with fresh fish. 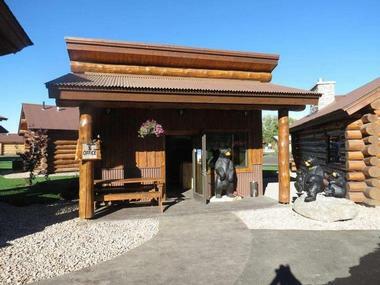 The Cowboy Village Resort lets guests stay in an authentic log cabin property that has modern conveniences and amenities with easy access to nearby amenities. There are 82 individual cabins to stay in as well as two lodge rooms. Every cabin has free wireless internet, kitchenettes, hair dryers, and flat-screen TVs with HBO and cable. There is an ADA cabin as well and you can enjoy dog-friendly accommodations and smoke-free cabins. Guests of the resort are welcome to make use of the hot tub and the indoor swimming pool. Take advantage of the business center and meeting room or get in a workout in the fitness center. Use the barbeque grills and take advantage of the covered decks. Do your laundry on site. For those who want to visit nearby attractions, this is easy to do as there is a Start Bus stop along the edge of the property plus a Targhee Express stop in the winter. You can also walk the short six blocks to the Town Square or drive two miles to the National Elk Refuge. Grand Teton National Park is just ten miles away and Yellowstone is only 55 miles, making either highly doable from Cowboy Village Resort. The Rustin Inn at Jackson Hole sits on 12 acres of lush land right next to the National Elk Refuge and within blocks of the lively town square. 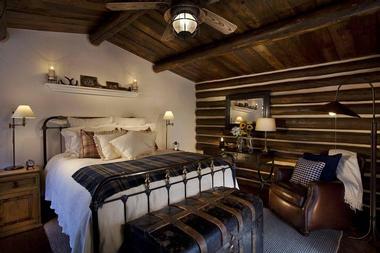 This boutique hotel has luxury log cabins and lavishly-appointed historic lodgings. Highlights of the rooms include 42-inch (or larger) flat-screen TVs, Molton Brown bath amenities, bathrobes, fine linens, double pillow-top mattresses, and complimentary Wi-Fi. You can also enjoy vaulted ceilings, large picture windows, private verandas with Adirondack chairs, rain showers, spa bathrooms, fridges, microwaves, hairdryers, DVD players, gas fireplaces, and/or coffeemakers. Spa Suites have large soaking tubs, full kitchens, and more. Spa Suite guests get access to the spa facilities, a backyard area with a fire pits and a hut tub, and the private lobby bar. Relax in the outdoor heated pool, sauna, and Jacuzzi or visit the full-service on-site spa with its eucalyptus steam room. The fitness center is open 24/7. Guests can also use seasonal fire pits, Wi-Fi, ski storage, and laundry facilities, or fish on the Wetlands Walk on Flat Creek. Guests are welcome to enjoy the lounge’s full bar and wine cellar selections plus modern American menu. Start the day with a gourmet breakfast buffet. 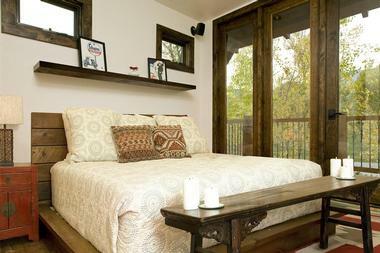 The Fireside Resort has LEED-certified cabins that are sustainably built with a rustic yet modern design. Enjoy the feel of a boutique hotel with luxury accommodations while surrounded by nature and the feel of a wooded campground plus the privacy of a private residence. There are 25 cabins to rent, each with a private furnished deck, private campfire, cozy fireplace, Wi-Fi, and full kitchen. Other amenities include picnic tables and small propane grills, flat-screen TVs, Tempur-Pedic mattresses, goose-down pillows, luxury linens, European-style duvets, parking spots, and dog-friendly choices. Housekeeping is also available upon request. The resort has wireless internet so you can stay connected. Make use of the centrally-located hot tub to unwind. You can rent a Jeep right on the property and reserve it when you book your cabin so you don’t have to worry about getting around. During your downtime, nature and attractions are just minutes away, including skiing, snowboarding, and hiking. Teton Village and Wilson are each five minutes away with Jackson Hole seven minutes away and Grand Teton National Park just eight. When you stay at Flat Creek Ranch, you get an all-inclusive experience so you do not have to worry about finding additional things to do or worrying about food. The five cabins all have wood-burning stoves, basic first aid kits, daily spruce ups, private porches with deck furniture, small hair dryers, custom made soap, down comforters and pillows, wool blankets, flannel sheets, and all-natural lotion, conditioner, and shampoo. Guests have access to all the recreational equipment on the ranch, which includes hiking and fishing equipment, a drift boat, paddleboards, sit-on-top kayaks, and canoes, giving you numerous options for outdoor activities. There is also a sauna and hot tub plus family activities like horseshoes and ping pong. Beginner to intermediate anglers can attend the fly fishing clinic. There are also complimentary guided hikes with available day-long ones as well. Join the trail rides that take place three days a week. Guests also get complimentary transportation to and from Jackson and the Jackson Hole airport at scheduled times. Three meals each day are included with your stay, including a “heaping” breakfast, a healthier lunch, and a gourmet ranch dinner. Sack lunches filled with snacks are also available. At dinner and the cocktail hour, you get complimentary wine and beer. Flying Saddle Resort prides itself on being the only full-service resort that sits on the Snake River banks. Motel rooms have two queens or a king bed, vanity dressing areas, bathrooms, sleeping areas, and extra room plus free Wi-Fi, TVs, private entrances, and are pet-friendly. Tower Rooms have private balconies and the same bed choices, with a small sitting area in rooms with king beds. There are also private baths, fridges, microwaves, and large TVs plus Wi-Fi. Or opt for a Cabin with a private bath, king bed, living area featuring a desk and couch, private front porch, microwave, and fridge. Guests at this resort can fish in the river or go for a hike in the surrounding Bridger-Teton National Forest. There are also seven acres of land on the property to explore, including a hot tub and tennis court. You will also find a heated indoor pool, an exercise room, a soccer goal, a basketball hoop, an outdoor patio, and horseshoe pits. In the winter, go on a sleigh ride or a dog sled tour or snowshoe, cross-country ski, ski, snowboard, or snowmobile. Get a drink at the Western Sports Bar or dine at the Flying Saddle Resort Steakhouse. 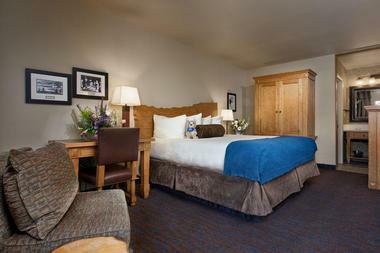 The Grand Targhee Resort provides accommodations, skiing, and more in a single location for convenience. This year-round mountain resort offers slope-side lodging, townhomes and condos, or vacation homes. Lodge rooms have a private bathroom, coffee and tea, free local calls, high-definition TVs, phones, and boot dryers with some pet-friendly rooms. They are within an easy walk to the ski lifts. Teewinot Lodge rooms add coffeemakers, mini-fridges, and microwaves. Suites are also available close to the lifts while the townhomes, condos, and vacation homes are on the way to the resort and loaded with amenities to make you feel as if you are at home. You can also opt for seasonal RV camping. Guests can also request playpens and cribs or borrow books and board games. Guests have access to the resort’s shuttle so they can get around with ease. The property also has a hot tub, a heated outdoor saltwater pool, a 24-hour Arcade, and an area to exercise. You will find overnight storage for skis and snowboards. There is no need to leave the mountain to eat as you can dine at Wild Bill’s, Snorkels Bistro, The Trap Bar & Grill, or The Branding Iron Grill. There is also a general store for essentials and snacks. The Hotel Jackson is just a few steps from the Historic Town Square and a quick five miles from Grand Teton National Park. There are 55 rooms, which include four spacious suites. All rooms have your choice of two queen or one king bed, domestic phone service, high-speed Wi-Fi, 48-inch Samsung Smart HDTVs, Geneva sound systems, individual heating and cooling, natural gas fireplaces, bath amenities from L’Occitane, plush towels and bathrobes, digital scales, hair dryers, in-room Nespresso machines, fridges, and safes. Certain rooms also have terraces, including all top-floor rooms. Guests can request morning newspapers and commercial irons, ironing boards, and handheld steamers. Guests can enjoy complimentary transportation to shopping and dining in town, up to a 2-mile radius. 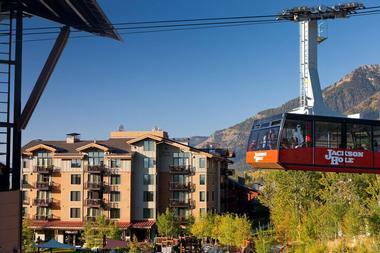 In the winter, there is complimentary transportation to Teton Village plus a ski valet. Unwind at the rooftop spa with its hot tub and views of the night sky or make use of the fitness center or Sacajawea Library. Stop by the tea and coffee station next to the Sacajawea Library or enjoy complimentary spa water and cookie breaks. Enjoy breakfast, a Mediterranean and Lebanese meal, or hand-crafted cocktails, appetizers, wine, and beer at FIGS. Get adult beverages with live music at the seasonal Smokin’ Iron. The Wort Hotel has provided guests with historic charm and luxury amenities since 1941, leading to its reputation as Jackson Hole’s top boutique hotel. 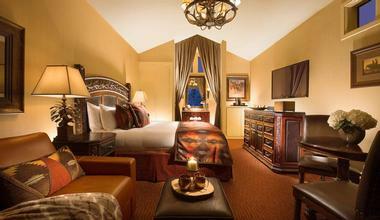 The 55 luxurious rooms plus five suites with Western themes give you numerous accommodations to choose from. 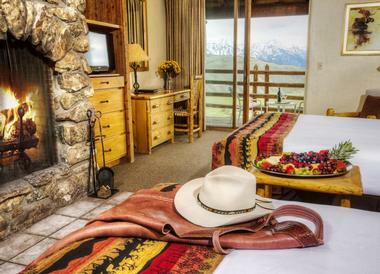 All rooms have unique decorations with original western art and custom-made furniture plus Keurig coffeemakers, Wi-Fi, plush bathrobes, bath amenities, an executive refrigerator, and a personal safe. Many accommodations also include sitting areas so you can relax without leaving your room. The hotel takes steps towards sustainability and offers a concierge. Make use of the property’s Jacuzzis to ease your sore muscles after skiing or get in an extra workout in the fitness center. Visit the Silver Dollar Grill for casual dining with views onto Broadway Street, an extensive wine list, and a “Little Buckaroos” Menu. Get a drink at the Silver Dollar Bar, where you can also find signature items such as elk gyros and burgers plus unique cocktails. The Showroom is inside the Silver Dollar Bar, showcasing regional and local bands. 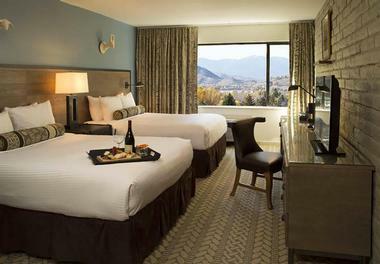 The Hotel Terra Jackson Hole has a stunning location and premium lodging packages to make your stay memorable. Guest rooms include two queen beds or a king bed, an HD TV, a deep soaking Zuma air-tub, a Rain shower, a double vanity bathroom, a mini-fridge, a coffeemaker, heated bathroom floors, and an iPod docking station plus a spacious entry foyer, oversized windows, and high ceilings. Studios can add in a furnished terrace, fully-outfitted kitchen, dining room table, living area, and inlaid gas fireplace. Two and three-bedroom suites are also available with similar amenities to the studios. When you want to relax, head up to the rooftop hot tub or go for a swim in the rooftop infinity pool. You can also enjoy the separate women’s and men’s steam showers, the Chill Spa, the Spa tranquility lounge, and the modern fitness center. There are multiple shops on site for finding upscale designer fashion, outdoor gear, locally-made souvenirs and more, and handmade gifts. Those who plan on skiing can enjoy the on-site Ski Valet with rentals and more while everyone will appreciate the Concierge Services. Enjoy a delicious Italian meal at Il Villaggio Osteria or get an apres and dining experience at Bar Enoteca, which is also open for breakfast. Kodiak Mountain Resort sits by the Salt River Mountains’ base, giving guests quick access to outdoor adventures such as fishing, snowshoeing, hiking, cross-country skiing, horseback riding, and more. There are four cabin styles, including for families or couples and those with two queen or a king beds, plus an RV park. Amenities include wardrobes/closets, alarm clocks, 50-inch LED TVs, outdoor furniture, wake-up service, parquet/hardwood floors, outdoor dining area, towels, coffee machines, spa tubs, fridges, toiletries, showers, phones, air conditioning, hair dryers, fireplaces, microwaves, fans, heating, private entrances, sofas, and more. 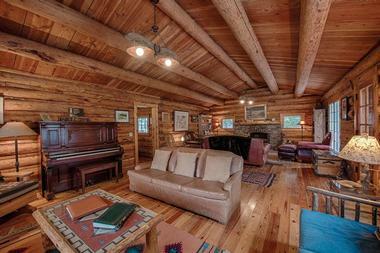 The family cabin also has a full kitchen and room to sleep six while the couples retreat has a jetted tub. In addition to a range of outdoor activities on and immediately next to the property, the resort also has multiple outdoor therapeutic hot tubs plus numerous locations to sit and relax while enjoying nature. Get pampered in the spa or use the free Wi-Fi throughout the property. Other amenities include free parking, free evening entertainment, a garden, bowling, concierge services, and horseback riding. Use the BBQ facilities to make a delicious meal. 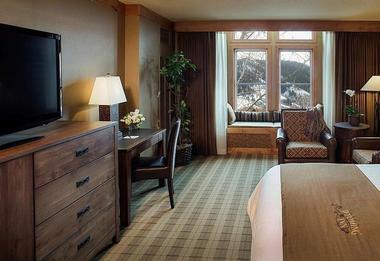 The Lexington at Jackson Hole Hotel & Suites offers a range of accommodations surrounded by natural beauty. All rooms have individually-controlled A/C and heating, bath products from RUSK, hair dryers, irons plus ironing boards, full cable HDTVs with free HBO and ESPN, heavenly-style Serta Perfect Sleeper Pillowtop Mattresses, microwaves, fridges, and Keurig coffeemakers. Suites with kitchenettes and living areas are also available, as is a condo. 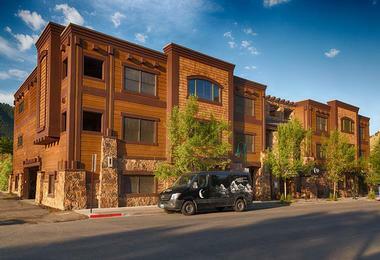 Guests can take advantage of the complimentary airport shuttle or the winter ski shuttle to take you to Teton Village. Let your kids enjoy the children’s pool while you use the indoor hot tub. Borrow bikes for the whole family and take advantage of the 24-hour lobby and front desk, free guest parking, coin-operated laundry, Tesla charger, business center with computer and printer, and conference and meeting facilities. The entire property has complimentary high-speed wireless internet. The day starts off with a complimentary hot breakfast buffet. You can also find fresh chocolate chip cookies plus coffee from the local Snake River Roasting Company and other complimentary beverages in the afternoon. The Snake River Lodge & Spa prides itself on combining a rustic feel with modern amenities in a luxury hotel at the base of the Jackson Hole Mountain. There are 125 guestrooms and suites in addition to 30 residences with full kitchens and between 1,400 and 4,500 square feet of space with two, three, or four bedrooms. Rooms feature fridges, irons, ironing boards, electronic safes, and gourmet tea and coffee. 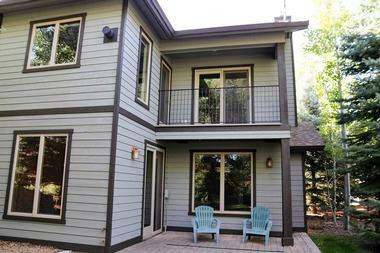 You can also enjoy a private or shared balcony, large closet, sitting/dining area, comfy chairs, and/or fireplace. 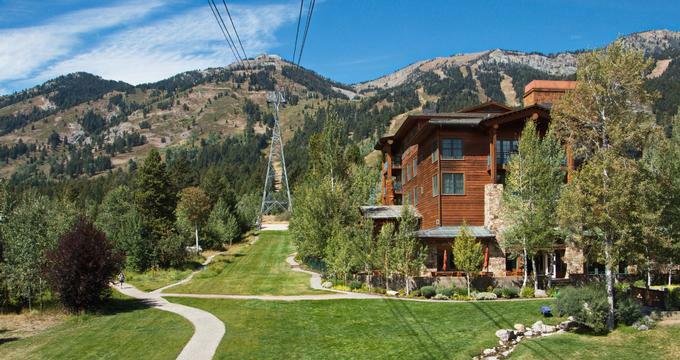 From the lodge, you are only 300 feet away from the Jackson Hole Mountain Aerial Tram and a mile from Grand Teton National Park. Relax at the full-service spa with 17,000 square feet of space or in the indoor/outdoor pools that have cascading waterfalls and rock caves. There are also indoor/outdoor hot tubs, boot warmers, complimentary storage, babysitting, a shop, flexible meeting space, and a seasonal full-service ski valet. Plan an excursion via the Backcountry Adventure Center or rent binoculars, bikes, hiking poles, and more. Visit Gamefish Restaurant and Bar to enjoy western cuisine. The Snake River Bar & Lounge has craft beers, wines, and hand-crafted cocktails. Snow King Mountain Resort is a year-round resort that offers activities for guests to enjoy in the summer and winter months. You can stay at the Snow King Resort Hotel for ski-in, ski-out accommodations by the base of Rafferty Chairlift. There are 203 double-queen and king guestrooms with cozy comforters, premium cable, pet-friendliness, and wireless internet. Alternatively, you can choose to stay in one of the four properties of Town Square Inns downtown. The list of activities at Snow King Mountain Resort is truly extensive. During the summer, you can go hiking, bouldering, biking, paragliding, or use the alpine slide, bungee trampoline, scenic chairlift ride, Amaze’n Maze, mini-golf, Summer Cowboy Coaster, Treetop Adventure, or Big King Pass. During the winter, activities include skiing, snowboarding, Jackson Hole Ski School, Winter Cowboy Coaster, King Tubes, scenic chairlift ride, night skiing, terrain parks, Alpine Race Training, Winter Big King Pass, Uphill Travel, and Alpine Ski Racing. When you want to eat, consider King’s Grill in the Rafferty Center for burgers, snacks, drinks, and more. Snow King Resort is just minutes from Grand Teton National Park and blocks from other attractions. There are 203 guest rooms plus 85 vacation rentals offered as either classic or luxury condos. Rooms have local and 800 calls, wireless internet, hair dryers, coffee service, bottled water at check-in, premium cable selections, and available pet-friendly options. The accommodations deliver ski-in-ski-out access for Snow King Mountain. Condos feature gourmet kitchens with high-end appliances and enough space for families or groups. There is overnight parking and you can find daily local papers in the lobby. Guests also get shuttle service to Jackson Hole Airport and Teton Village (seasonally for skiing). There is a 24-hour fitness center, The Clip Joint hair salon, Olga’s Day Spa, and rentals for mountain bikes, skis, and snowboards at the Snow King Mountain Sports Shop. Use the year-round outdoor hot tub and the seasonal outdoor heated pool. Guests can take advantage of the function space and complete business center. The on-site full-service restaurant, Haydens Post, is open all day long and includes a bar menu. Spring Creek Ranch sits on a wildlife sanctuary that is nearly 1,000 feet above Jackson, delivering amazing views of Grand Teton and the rest of the Teton Mountain Range. Guests can stay in inn rooms, townhouses, or mountain villas. There are four inn rooms in each of nine rustic cabins, offering your choice of a king bed or two queen beds plus a wood-burning fireplace, fan, humidifier, a fridge, Cowboy Coffee, a coffeemaker, a balcony/patio, high-speed wireless internet, cable TVs with HBO, and within walking distance to the Granary Restaurant and Reception Building. Townhomes and mountain villas have extra space, kitchens, and living rooms. If you need to unwind, visit the Wilderness Adventure Spa for a High Altitude Hot Stone Heaven Massage. Other on-site amenities include a 24-hour business center, complimentary area shuttle with reservations, an airport shuttle, babysitting, computer station, concierge, cross country trails, dry cleaning and laundry, a lobby fireplace, free newspapers, self-parking, a gift shop, an outdoor fire pit, a pool with sun loungers, a spa tub, and a steam room. Dine at the Granary Restaurant with its floor-to-ceiling windows. If you opt for a breakfast plan, two guests get breakfast in the Granary Restaurant. There is also a BBQ option at Sage Overlook. 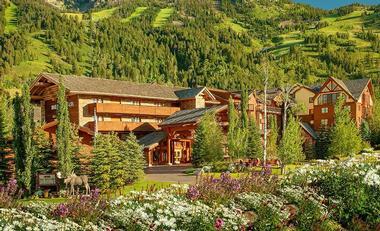 The Teton Mountain Lodge & Spa is just a mile away from Grand Teton National Park and next to the slopes of Jackson Hole Mountain Resort. 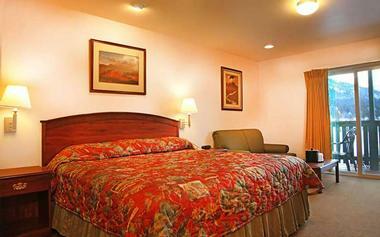 This luxury lodging facility has breathtaking views and nightly turndown service upon request. Various room types can sleep between two and 14 people. Standard amenities include safes, personal care products, bathrobes, irons with boards, hair dryers, boot dryers, high-speed Wi-Fi, large flat-screen TVs with DirectTV, available DVD players, mini-fridges, and coffeemakers. You can also enjoy a dining table, full kitchen, double-headed rain shower, breakfast bar, furnished balcony, and/or granite countertops. SpaTerre is the property’s full-service spa featuring ten treatment rooms, including two for couples plus a steam room and tranquility lodge. You will also find outdoor and indoor pools, a fitness center, and five different whirlpool hot tubs, including both indoor and outdoor options. Other services include the concierge, valet parking, bell services, ski valet, dry cleaning and laundry, and a 24-hour front desk. Spur Restaurant & Bar serves elevated “mountain cuisine,” offering every meal of the day plus room service and a full-service bar. Alternatively, you can order grocery delivery. The Lodge & Spa at Brush Creek Ranch prides itself on offering the ability to stay at a luxury dude ranch with an all-inclusive vacation. There are 13 Trailhead Lodge Rooms to stay in with two full/queen beds or one king bed, 400-thread-count sheets, hairdryers, toiletries, plush robes, daily housekeeping, granite-topped coffee stations, wireless internet, mountain views, and western furnishings and artwork. The nine Cabin Suites have a range of beds and some feature sleeper sofas along with similar amenities with cabin residences offering multiple bedrooms, full kitchens, dining areas, washers/dryers, and spacious living areas. 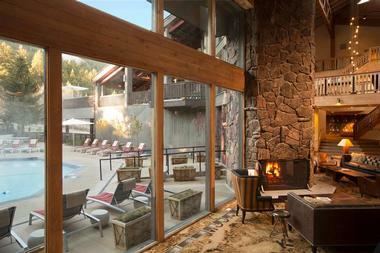 The Lodge has large open-hearth fireplaces and 28-foot ceilings to admire. On the property and immediately next door, you can enjoy shooting sports, fly fishing, trail adventures, horseback riding, glamping, yoga, the fitness center, and more. Your kids will love the Lil Wrangler Clubhouse led by professionals. There is a full-size gym with volleyball and basketball among other court sports plus a Western saloon with billiards, poker, and darts. The indoor arcade has air hockey, shuffleboard, table tennis, and more or borrow a lawn game. Have an opulent meal at the Trailhead Lodge or a campfire at the Creekside Dinner Camp, accompanied by an extensive wine list. 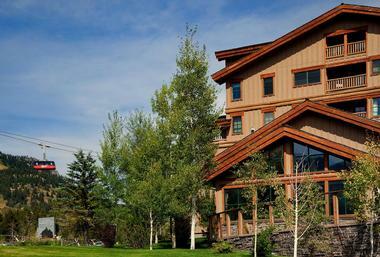 The Lodge at Jackson Hole delivers downtown luxury lodging a quick drive from Town Square. All of the 154 premier guestrooms have 400 square feet of living space that includes a pull-out sofa sleeper in the sitting area. They also have double pillow-top mattresses, fine linens, spacious modern bathrooms, rain showers, granite countertops, Molton Brown bath amenities, executive desks featuring built-in electronic hubs, 51-inch Samsung 3D HDTVs, Keurig coffeemakers, irons, hairdryers, iHome radios, microwaves, wireless internet, and beverage coolers. No matter the season, you can get ready to enjoy the indoor-outdoor heated pool with towel service. Enjoy the outdoor Jacuzzi, the sauna, and the indoor soaking tub. 24-hours a day, feel free to head to the fitness center or use the guest laundry. There are also two spa treatment rooms when you want to feel pampered. No need to worry about transportation at the lodge as there is free parking. You will appreciate the full-service Ski Rental Shop plus storage area. The lodge also offers concierge service, dry cleaning, a self-service business center, an in-town courtesy car, airport transportation, and winter ski shuttles. Head to the Fireside Lounge for light fare and a full bar menu. All guests are treated to a gourmet breakfast buffet. The Parkway Inn sits on a quiet street three blocks from the Historic Town Square, which is locally owned and operated, offering hospitality for more than 30 years. 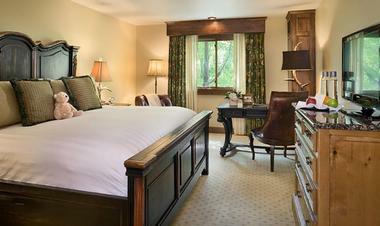 There are 33 guest rooms plus ten suites spread between two buildings, along with four more suites in another cottage. Superior rooms have two queen beds or a king bed, top-of-the-line Serta pillow-top mattresses, deep soaking tubs, private bathrooms, phones with dual ports, alarm clocks, color TVs, toiletries from Lord and Mayfair, hair dryers, irons, coffeemakers, granite countertops, fridges, and flat-screen TVs. One-bedroom suites have separate bedroom and sitting areas, the latter of which includes a sleeper sofa plus chair. The bedrooms have chairs, king beds, and TVs while the dressing area includes a mini-fridge, vanity, and coffeemaker. Or choose a two-bedroom suite. The inn provides books and board games for guests to borrow during their stay. Guests can use the Jacuzzi tubs, indoor lap pool, wireless internet, lobby computer, dry saunas, and gym area. The day begins with a complimentary continental breakfast in the fireplace lounge, including cereals, granola, bagels, fresh fruit, baked goods, yogurt, and fresh-brewed coffee. The afternoon includes cookies with lemonade or hot apple cider depending on the season. The Rusty Parrot Lodge is a 32-room lodge that is family-run and among the world’s top small luxury hotels. Each room has its own individual appointments but with L’Occitane bath amenities, fine linens, soft terry robes, slippers, plush towels, free wireless internet, and flat-panel satellite TVs. Expect European down pillows and comforters. 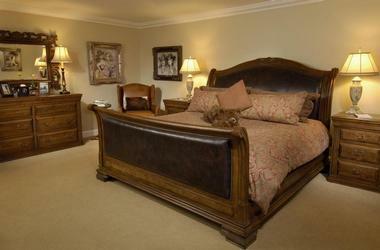 You can also choose a room with a handcrafted king bed, two queen beds, and/or a fireplace. There is also a suite with a whirlpool that fits two people, a walk-in shower, and a fridge plus dry bar. The Body Sage Spa is ready to pamper guests and ensure the utmost relaxation. There are also inviting common areas to sit and relax plus great views of nature. The Wild Sage has a 32-seat gathering room that shows off the exhibition-style kitchen where the chefs prepare delicious regional offerings and you can browse the extensive wine list. The restaurant is open for breakfast and dinner. The White Buffalo Club puts you right in the middle of downtown Jackson Hole with high-end amenities, amazing views, and guest-centric services. In addition to the on-site accommodations, the hotel can assist you with off-site vacation rentals of homes and condos. There are 30 suites Guests can take advantage of the complimentary yoga and fitness instruction with a personal trainer on site. Relax on the rooftop terrace while soaking up the sun and enjoying the views or stay inside in the Fireplace Lounge. Unwind at the Day Spa, visit the 24-hour fitness center, or use the complimentary ski shuttle and ski valet to hit the slopes. There is parking both indoors and outdoors, concierge service, valet and bell service, a courtesy shuttle, and daily housekeeping. Although not on-site, a playground and tennis courts are within a short walk. Start the day with the complimentary breakfast and order room service later on. Dine at the USDA Prime Steakhouse & Bar or get a drink and some light fare in the Fireplace Lounge. 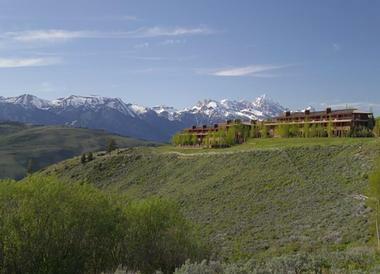 The Wyoming Inn of Jackson Hole is a picturesque retreat in the Grand Teton Mountain Range. There are rooms and mini-suites to choose from during your stay. 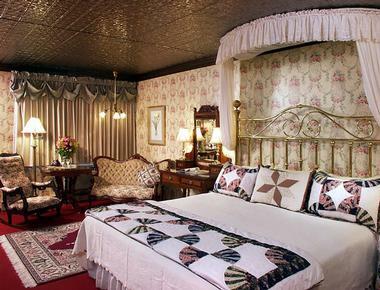 The accommodations have custom furnishings and authentic décor inspired by the west. Other in-room amenities include 42-inch flat-screen LG TVs, complimentary wireless internet, plush beds, lounge chairs, air conditioning, microwaves, fridges, glass-enclosed walk-in showers, granite countertops, iPod/MP3 docks, irons, elegant writing desks, extra bedding and towels, hair dryers, multi-line phones, and bath products from Essential Elements. Consider a room with a sleeper sofa, a window seat, and/or a fireplace. Guests get free parking as well as a fitness facility and gorgeous natural surroundings. The lobby will make an impression with its comfortable leather seating, wildlife art, western-themed Fredic Remington bronze sculptures, and wood-burning stone fireplace. Admire the custom hand-carved desk as you check-in. The Whistling Grizzly is the on-site restaurant that uses organic ingredients for its delicious breakfast items.